I still remember my first time at Phed Phed Cafe — how every single Isan (Northeastern Thai) serving made my friend and I go all wide-eyed because we did not expect the meal to be that mind-blowing. We both had the same question on our lips: “What took us so long to discover such simply amazing food?” And as though apologetic, we have become loyal supporters of the restaurant since. 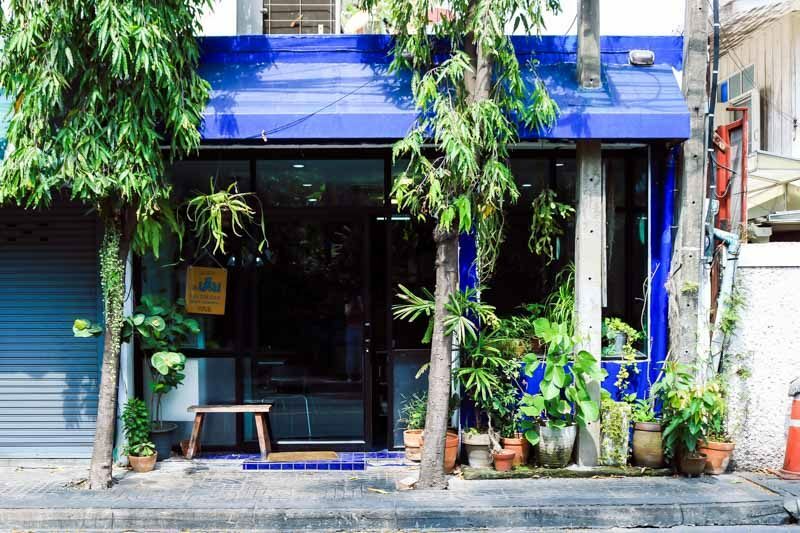 If you’re looking for a casual dining spot in Bangkok that brilliantly represents the heady flavours of Thailand, here’s a friendly introduction to where you should be heading. The Isan eatery is literally a hidden gem. Nestled in the quiet alley of Phahol Yothin 8, a short walk from Ari BTS station, it sits oddly and almost lonesomely in a small shophouse. My tip would be to look out for the striking cobalt blue hue cloaking its exterior. 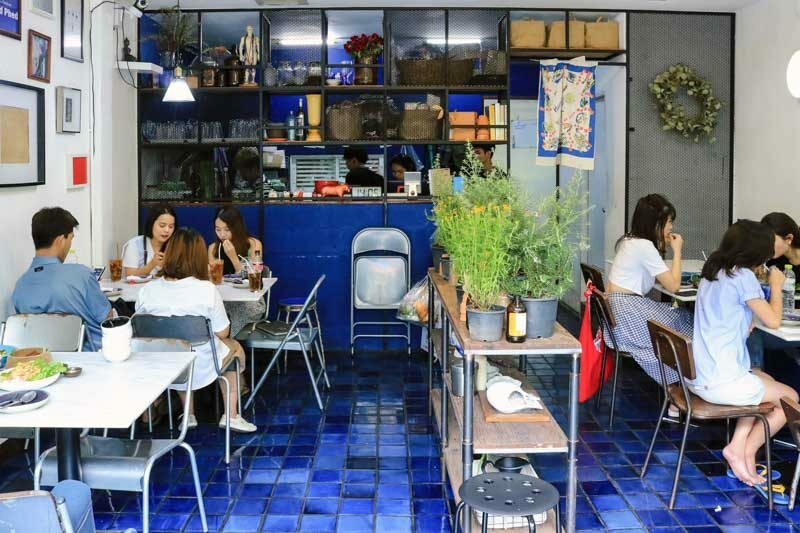 Phed Phed has another branch located in outer Bangkok at Ratchapruek called Phed Phed Bistro, but I would say Ari is more convenient to travel to and most importantly, more wallet-friendly. Stepping inside, diners are greeted by a modest interior; a comfortable setting with hints of artsy flair. With just 24 seats that quickly fill up during lunch and dinner hours, the restaurant only accepts bookings. 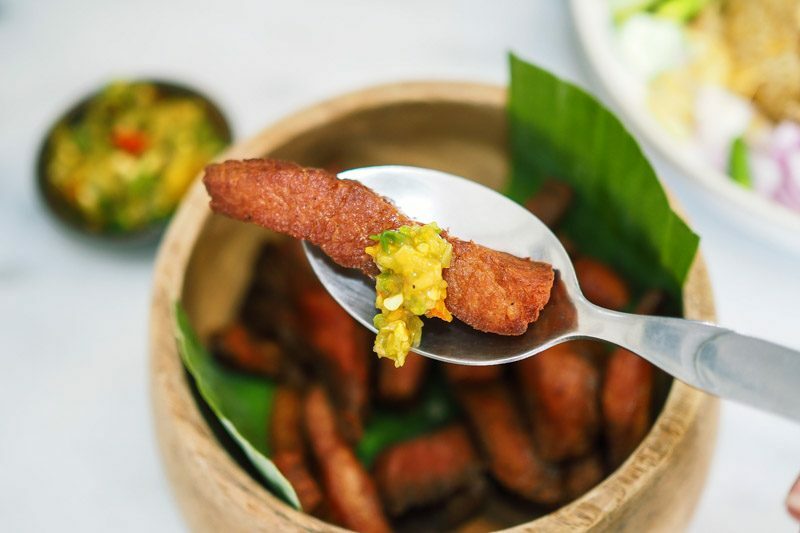 Drawing on co-founder Nattaphong Saehu’s Nakhon Phanom roots, Phed Phed Cafe serves homely Isan dishes concocted with house-made ingredients, including plara (fermented fish seasoning), curry pastes and sausages. 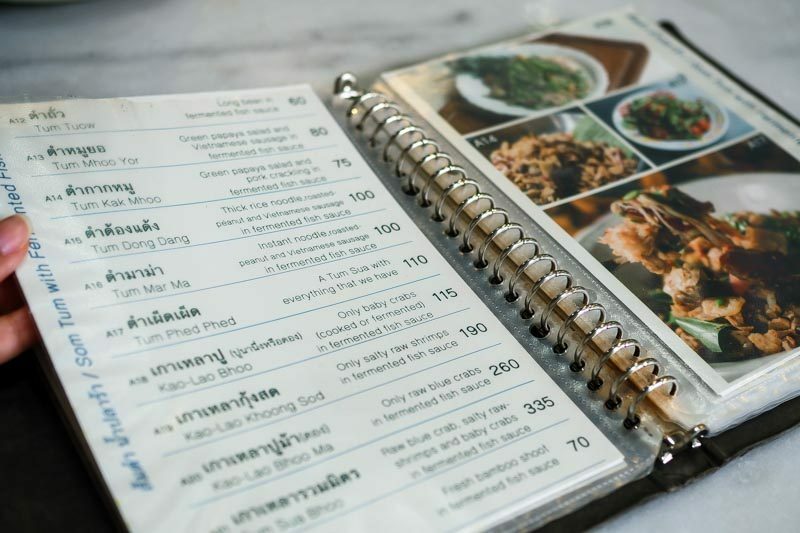 The menu lists more than 30 varieties of somtam (green papaya salad), from classics such as Somtam Pu Plara (THB60), made Laotian-style with baby crabs, to less conventional options like Tum Apple Kapi (THB85), a spicy salad of apples and dried shrimps in shrimp paste sauce. Do not forget to inform the staff of your preferred spiciness level! After all, ‘phed phed’ in Thai means ‘very spicy’. 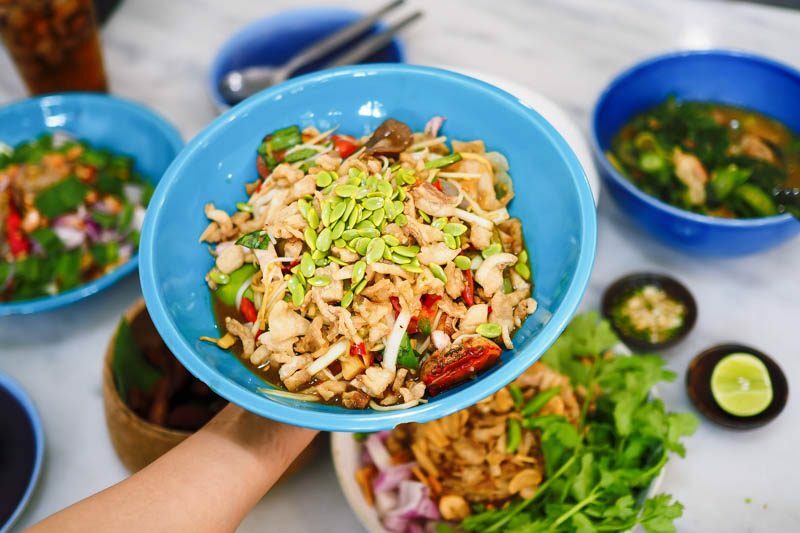 For adventurous Phed Phed beginners, go for the eponymous Tum Phed Phed (THB110), which is basically tum sua, a papaya salad that includes everything that the restaurant stocks or wishes to throw in at the given moment. 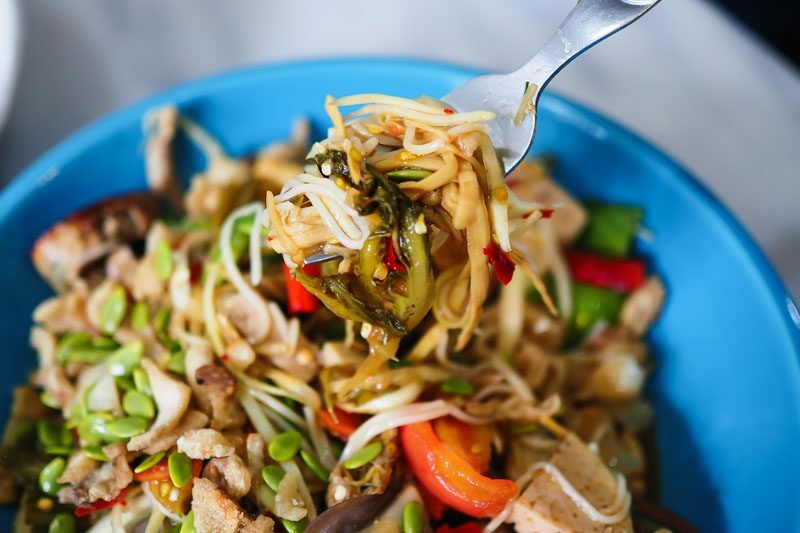 We ended up with a generous assortment of green papaya, fermented rice noodles, pork crackling, Vietnamese sausages, Wood Ear mushrooms, bamboo shoots, fermented cabbage, and baby crabs in a plara dressing and topped with fresh, pungent Kratin seeds on top. Every spoonful was brimming with explosive flavours — spicy and full-bodied in all the right ways. If you are not too keen on plara, there are loads of other somtam options on the menu for the less venturesome. Perhaps ask for the daily specials to try something seasonal. While it lasts, the Tum Mayongchit Nampla (THB280) is a popular favourite. Mayongchits, a must-try summer fruit, are sweet and luscious with a subtle tang, and have a texture very similar to mangoes. 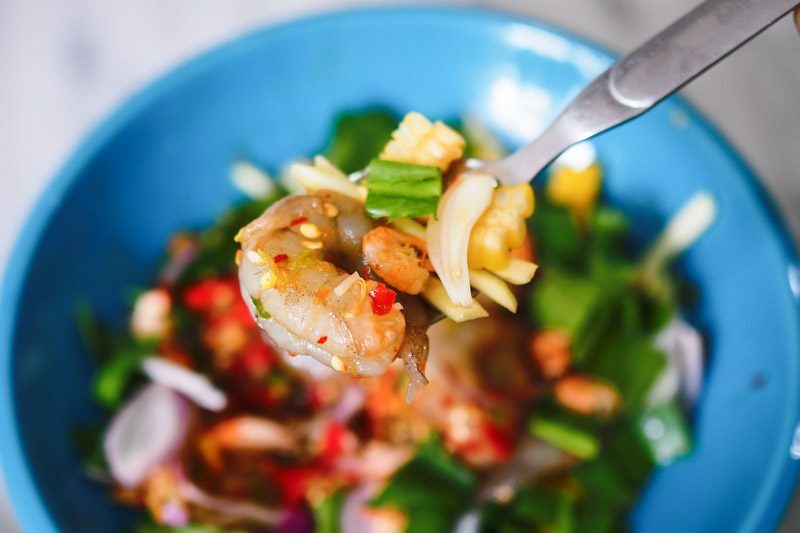 Tossed in a salty fish sauce dressing and finished with a handful of pounded dried shrimps in this dish, each juicy bite oozed true umami-ness. The fruit is generally only in season from February to April each year, so get it when you can. 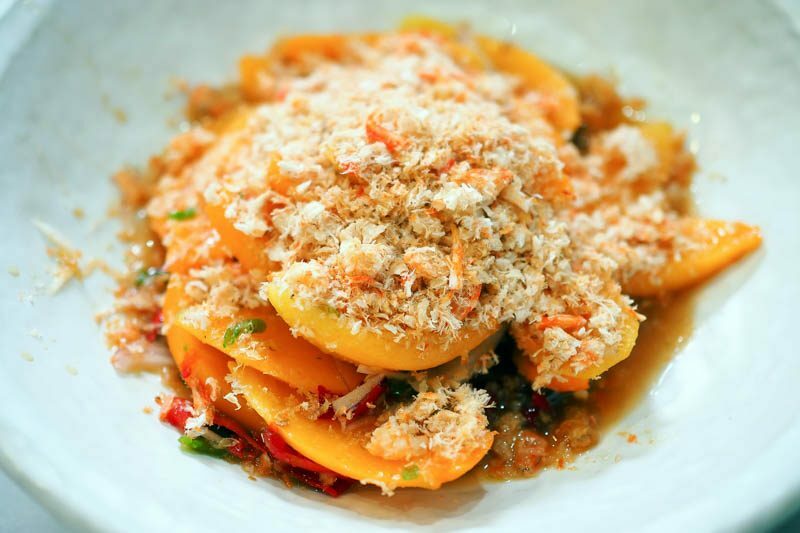 Fancy Isan-style ceviche? 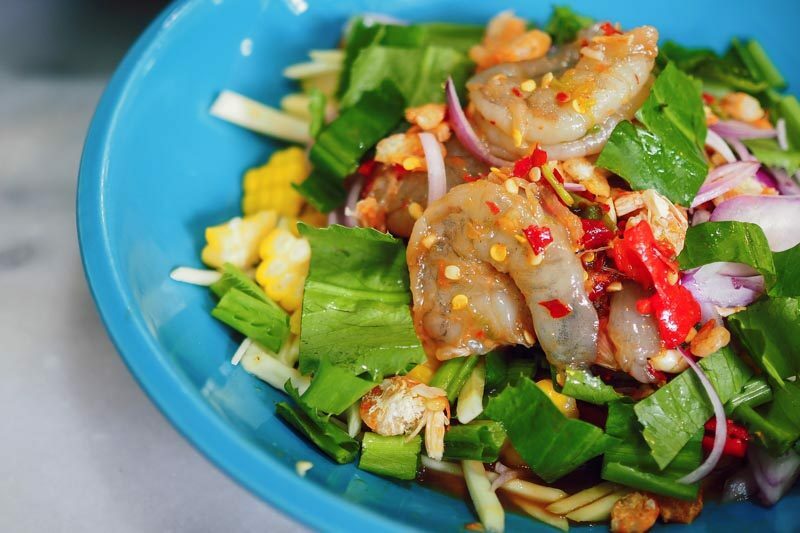 Give this dish a go: Yum Koong Sod (THB165), a spicy salad of plump and raw fresh shrimps. For this menu item, you have the option of saying ‘yes’ or ‘no’ to the plara route. 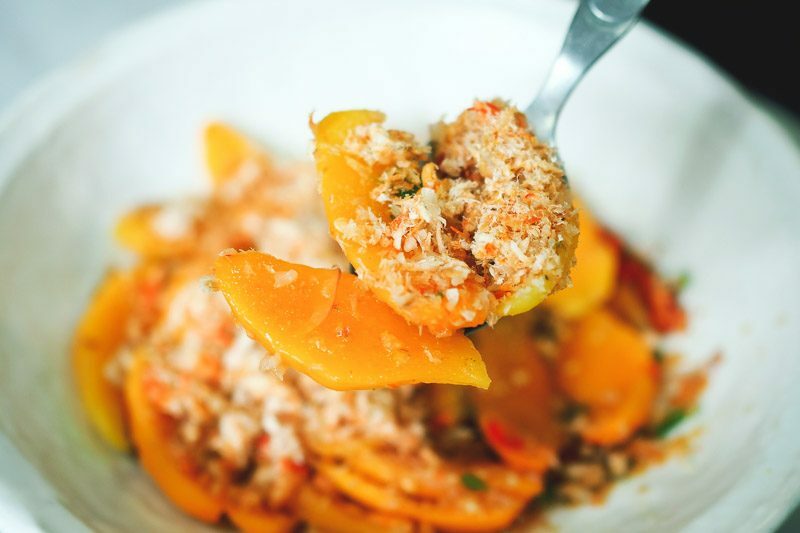 But with or without, the dish’s bold yet vibrant dressing, together with the tart green mangoes and sweet corn, complemented the star of the dish wonderfully. 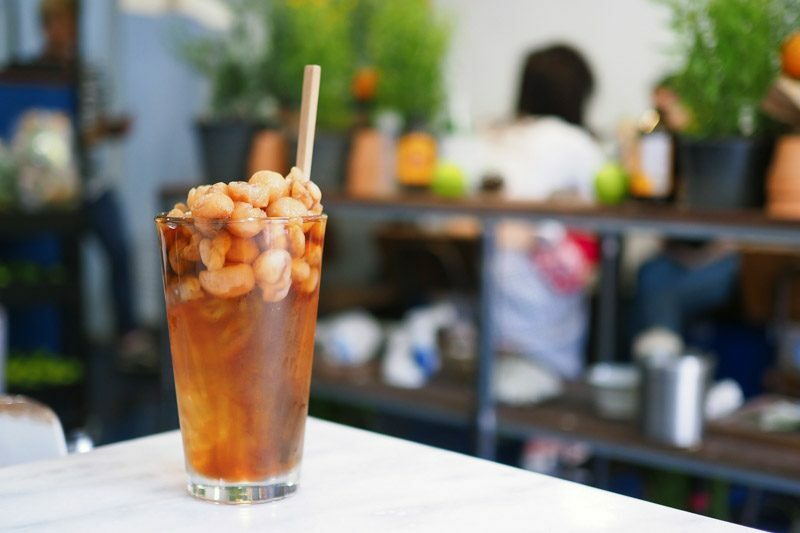 When things get a bit too potent, cool off with a refreshing glass of Longan Juice (THB50). 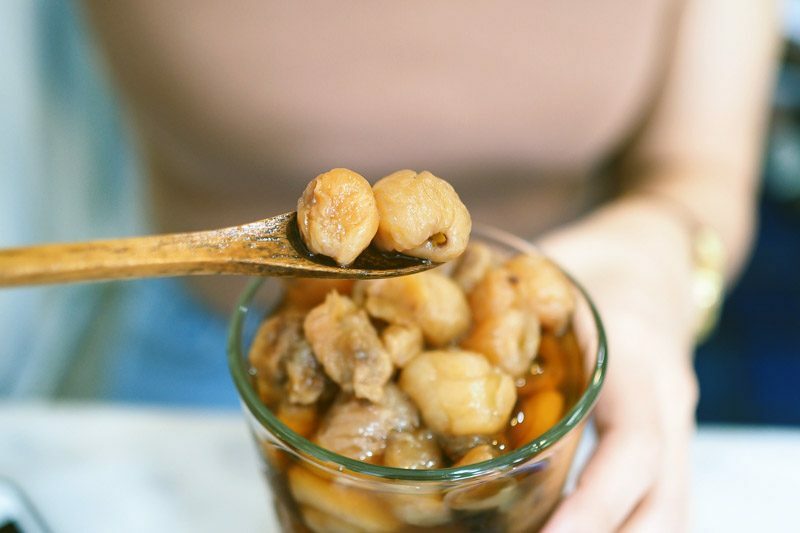 Sweet and energising, the homemade drink came overflowing with chunks of longan. For something meaty, I recommend the Kor Mhoo Thod Nampla (THB150). Think jerky, but more succulent. 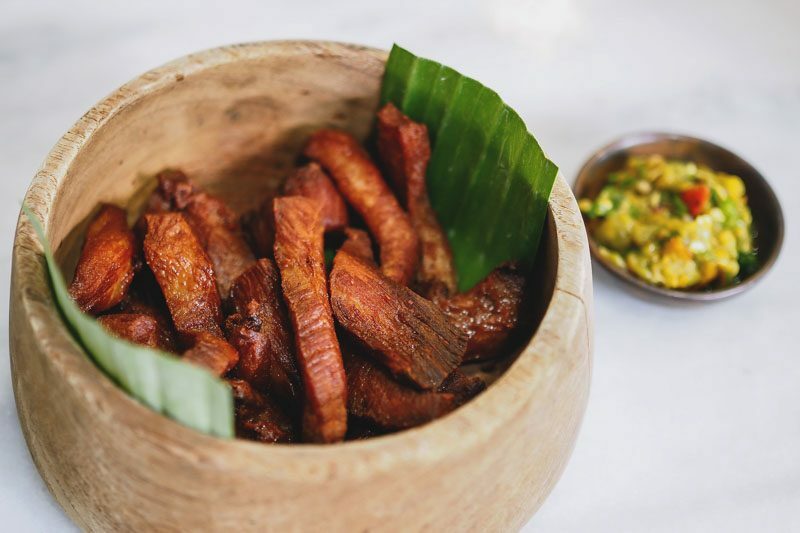 Cuts of pork are marinated in high-quality fish sauce and perfectly deep-fried until crisp on the outside. Incredibly aromatic and savoury, each piece was well complemented with the accompanying Nam Prik Ma-Uek (hairy-fruited eggplant chilli paste), which offered a harmonious contrast to the dish with its peppery and slightly acidic notes. A traditional Thai meal is never complete without a soulful bowl of soup. 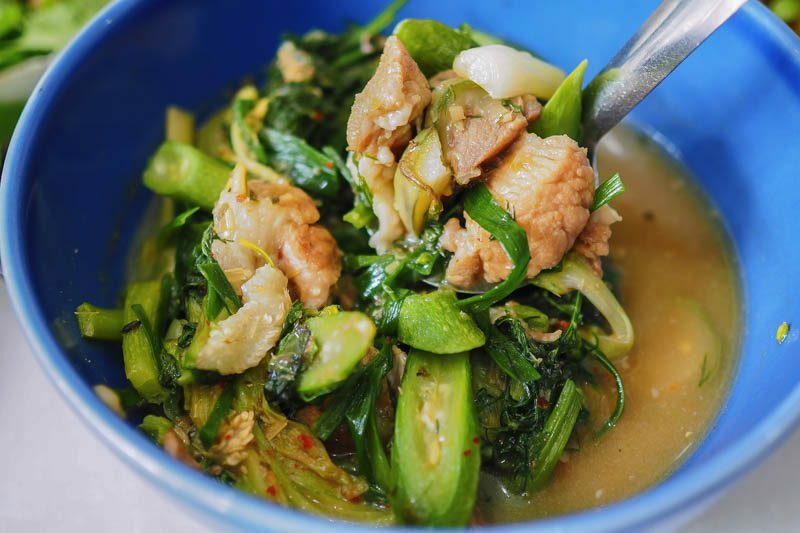 Try the Gaeng Om Mhoo (THB150), a spicy, Isan-style stew packed with a flavourful punch. At Phed Phed Cafe, the dish came loaded with super tender bites of pork ribs as well as a variety of local herbs and vegetables, such as dill and squash. Fragrant, light, and yet beautifully complex, a light slurp of the soup followed by a warm bite of sticky rice will leave you with a smile on your face. If you are only swinging by for a quick, light lunch before a long day around town, the restaurant also offers a solid list of single dishes. The Khao Pad Kak Mhoo Bacon (THB115), or fried rice with pork crackling and bacon, seemed to be a well-received pick. The dish had a lovely balance of savoury flavours thanks to the bacon and egg, while the crunchy pork crackling and garlic offered added texture. The rice wasn’t overly dry or oily and the whole mix tasted extra good with a squeeze of fresh lime. 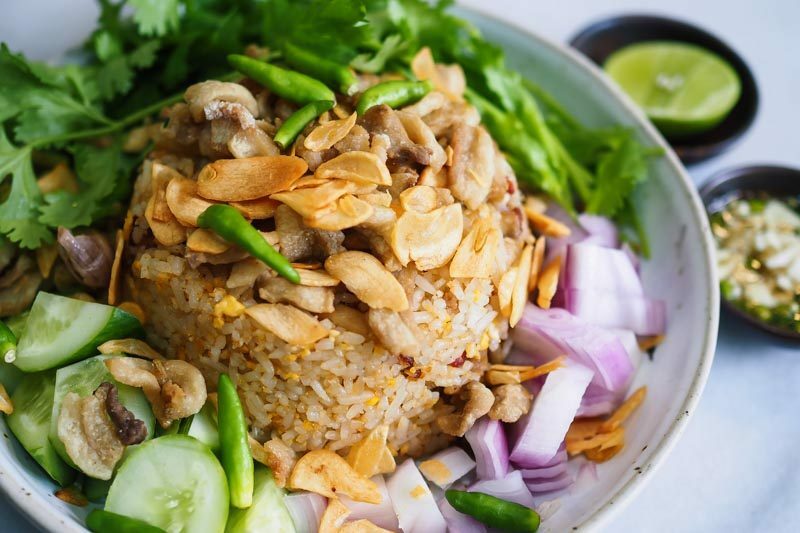 Everyone’s familiar with the usual staples of Thai cuisine, so why not try something different the next time you’re in Bangkok? 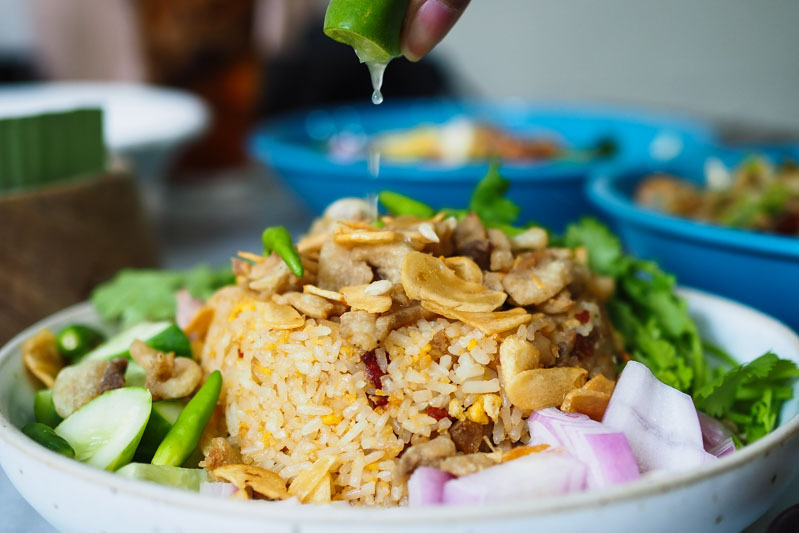 Isan cuisine is a true gem and full of different, complementary flavours, and Phed Phed Cafe is more than doing it justice. My final tips? 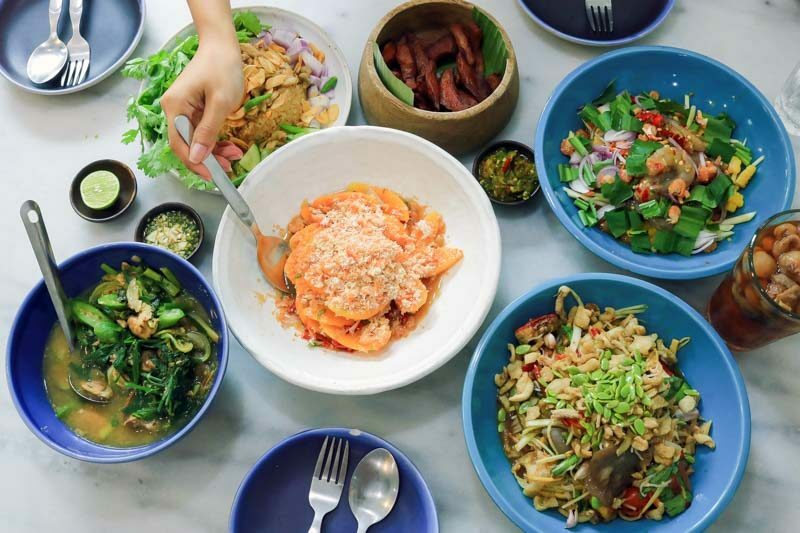 Come with enough people to share as many dishes as possible and also come prepared — the eatery is quite indie and only accepts cash and local mobile banking transfers.